I was curious as to how long a tatted piece of this size (it’s roughly two inches wide by an inch and a half tall) would takes me. This pattern was new to me and it took about 2.5 hours (this included having the thread break halfway through round one which meant starting over, having to pull out a hand full of stitches when I missed a join, and tucking tails). Probably not fast by an experienced tatter’s standards, but I felt like I had a pretty good pace. The butterfly turned out cute. I think I may consider tatting the antennae around wires next time to prevent the drooping caused by the beads. This is a pattern I will do again. 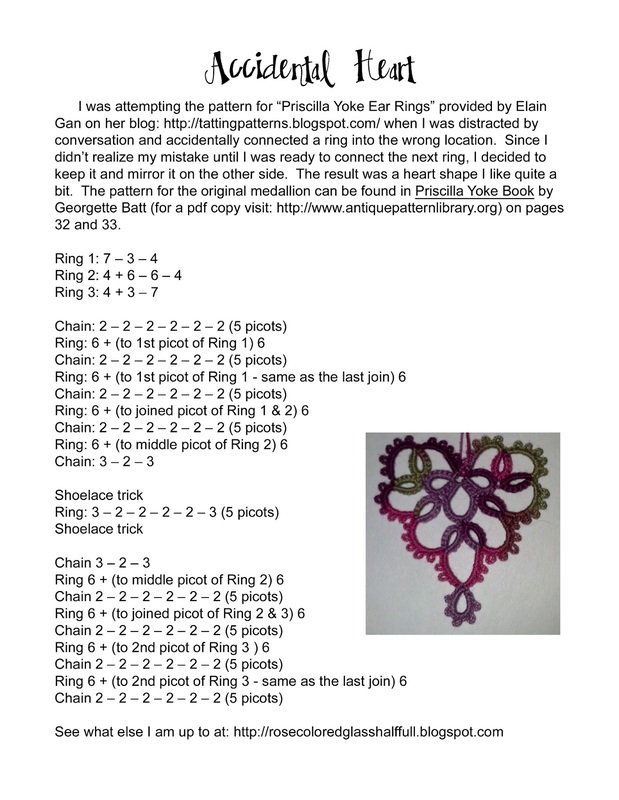 I was attempting the pattern for “Priscilla Yoke Ear Rings” provided by Elain Gan on her blog: http://tattingpatterns.blogspot.com (which I was linked to via a pin on Pinterest) when I was distracted by conversation and accidentally connected a ring into the wrong location. Since I didn’t realize my mistake until I was ready to connect the next ring, I decided to keep it and mirror it on the other side. The result was a heart shape I like quite a bit. The pattern for the original medallion can be found in Priscilla Yoke Book by Georgette Batt (for a pdf copy visit: http://www.antiquepatternlibrary.org ) on pages 32 and 33. Tatting is my newest hobby. I first took up a shuttle in late August of 2012. Since then, I have had a blast making all sorts of things. Some of them I have followed patterns to complete (like the heart from Patti Duff’s Minitats 69 Petite Motifs and Anne Bruvold’s Minor Norwegian Dragon), some of them I have looked at images and done my best to imitate (like yarnplayer’s “Belle” pendant), some of them have resulted from improperly following patterns (Mistakes can be pretty! ), and some of them have just resulted from me playing around with thread and shuttles. 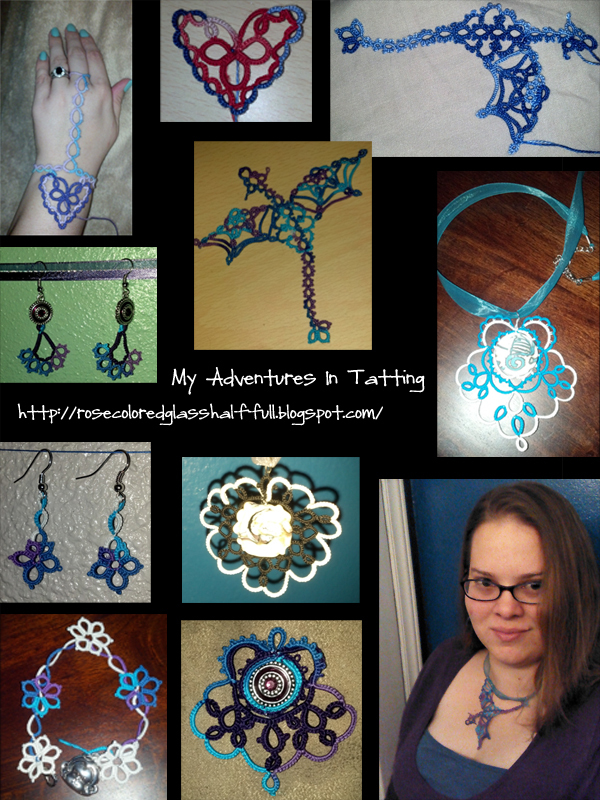 Making jewelry is my latest enjoyment with tatting. It is fun to see family member’s eyes light up when I give them a new necklace or a new pair of earrings. I love telling people that I made something I’m wearing. Tatting is great because it is a highly portable craft. There is rarely a time when my purse doesn’t have a work-in-progess in it. I have taken my tatting on planes, in cars, to church, to waiting rooms, and much more. 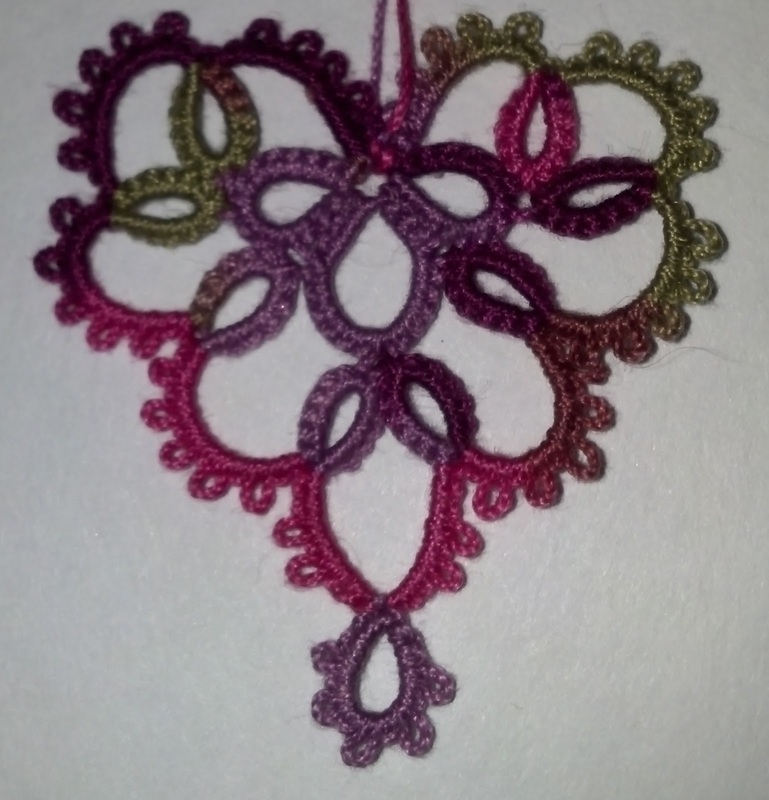 I’ve enjoyed tatting during ladies thread art nights. I am so glad that my mom’s neighbor taught me how to do this. I have also begun teaching five others how to tat as well. Between my tatting mentor and youtube videos, I have progressed rather quickly in the tatting art, though I would not delude myself into thinking that I am done learning. There are so many more skills that I want to learn. I hope to end 2013 being able to say that I have learned even more tatting skills to increase my ability. I also hope to show off the items completed by the people I am teaching. I plan on showing off some of these pieces in further detail in later blog posts and I plan on trying my hand at some new projects.